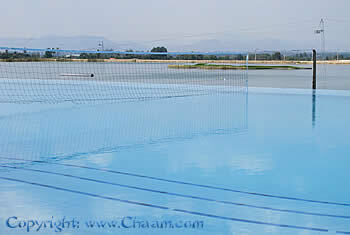 To enlarge an images just click on the picture! 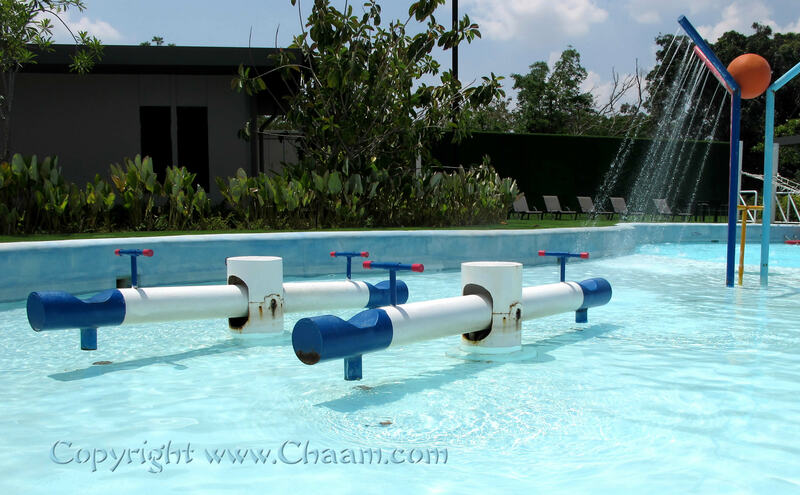 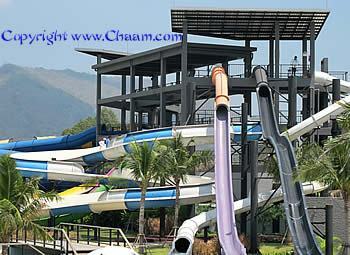 Less than 50 miles away from Cha-Am in Thailand the large Fun park Black Mountain Waterpark is located. 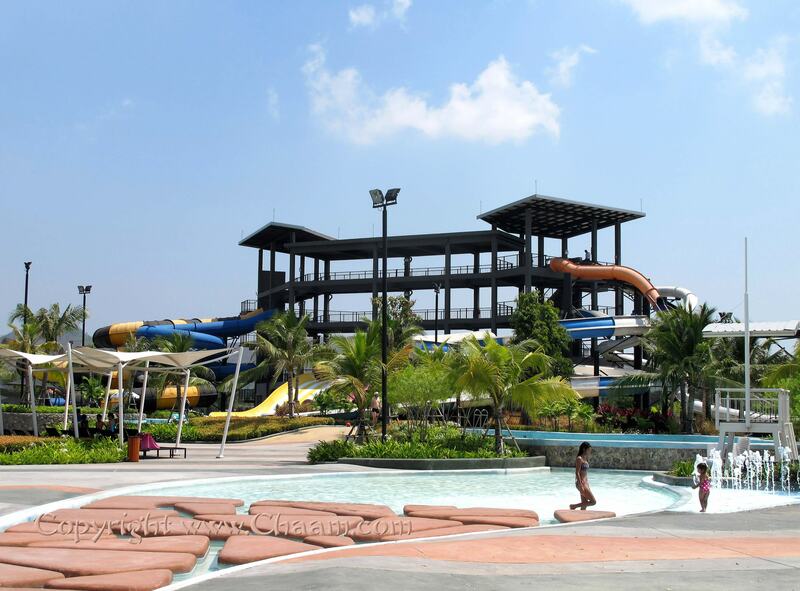 Close to the mountains located, the park offers not only a beautiful panoramic view, also an everlasting breeze fluttering, so that you can easily spend the whole day with your family there. 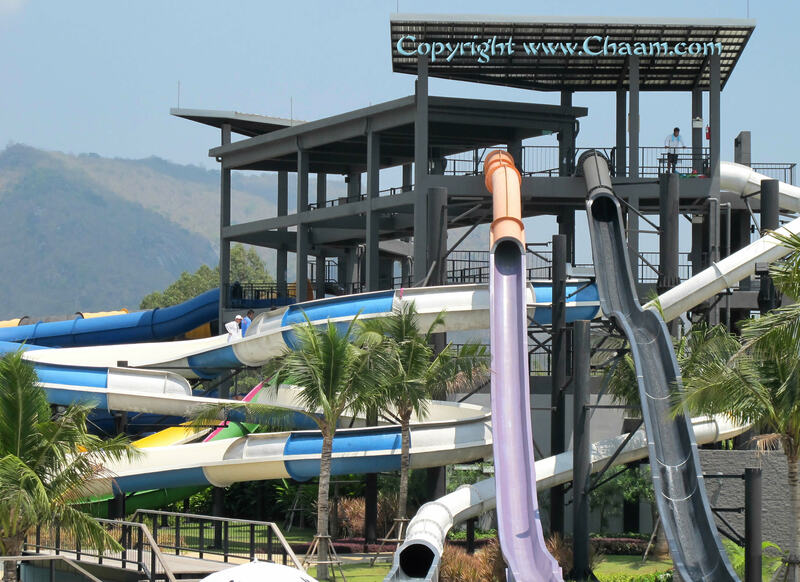 The ticket prices (as of middle of 2016) are moderate for the water adventure, so an adult is paying 600 baht and fairly 300 baht for a child. 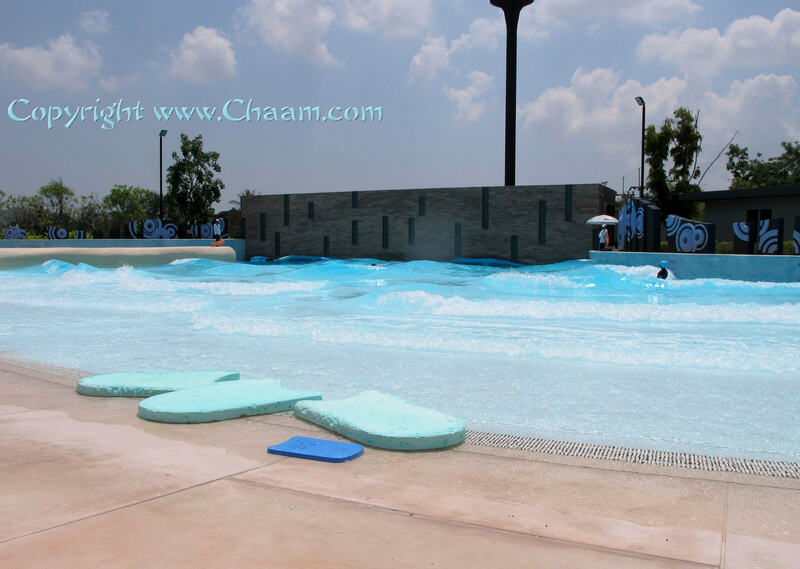 The opening times are from 10 a.m. to 5 p.m. seven days a week. So that cash can not be lost or is gone with the wind, there is a credit card system where you can "refuel" your credit at any time and the rest you get paid back at the end of the visit. 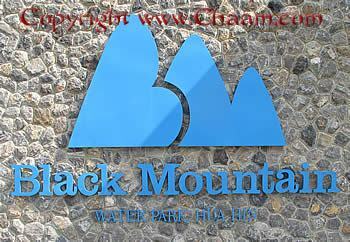 Once paid entrance, ALL attractions may be used so often as you like. 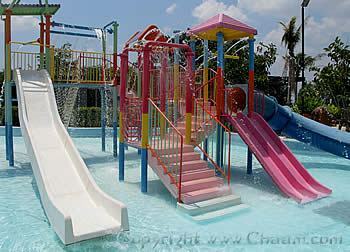 No hidden costs, such as in >> Santorinipark >> where you first pay admission and then you have to pay every attraction extra. 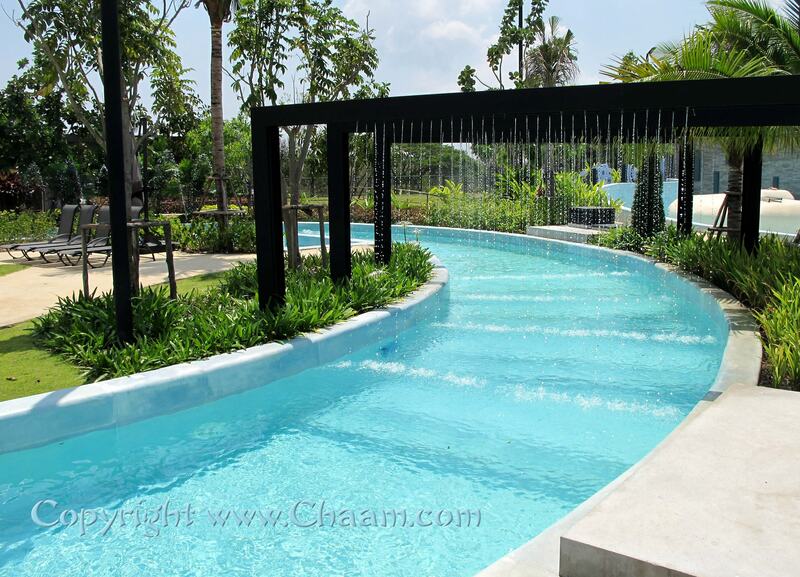 The paths in the park are all nonslip and there are some beautiful wooden bridges crossing over a water ditch.In the water ditch at the top right photo you can lie lazy on a big swim ring and let yourself drift in a circle. 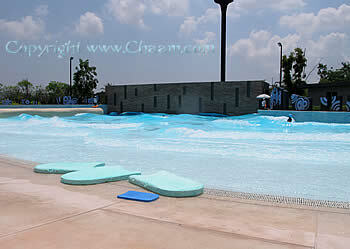 One rotation takes about 10 minutes, where you meanwhile can watch the beautiful landscape or just take a sunbath. 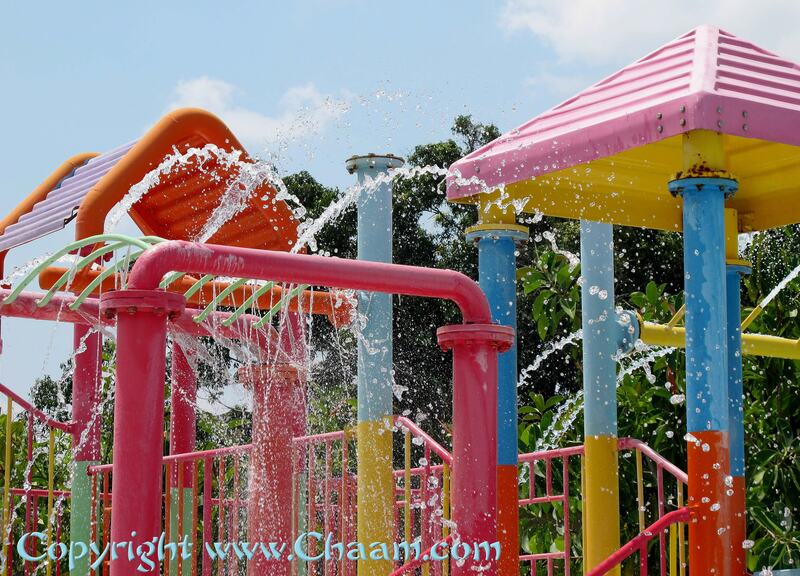 Starting from babyhood, you can visit this beautiful Aqua Park with your children, because the park was created primarily for children. There are many mini water slides, climbing rods, a wobbling bridge made out of thick ropes and hundreds of water jets that spray warm water in all directions. 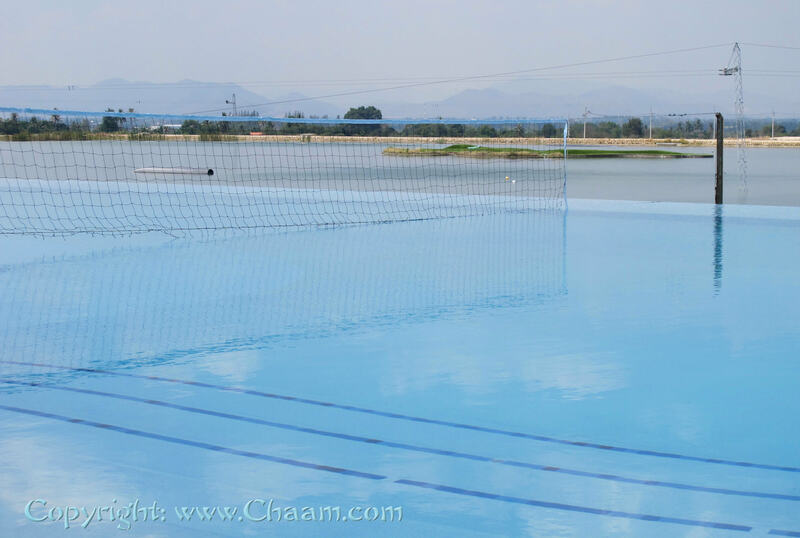 Those who like to do sports in the sun, are welcome to play water volleyball with a panoramic view. 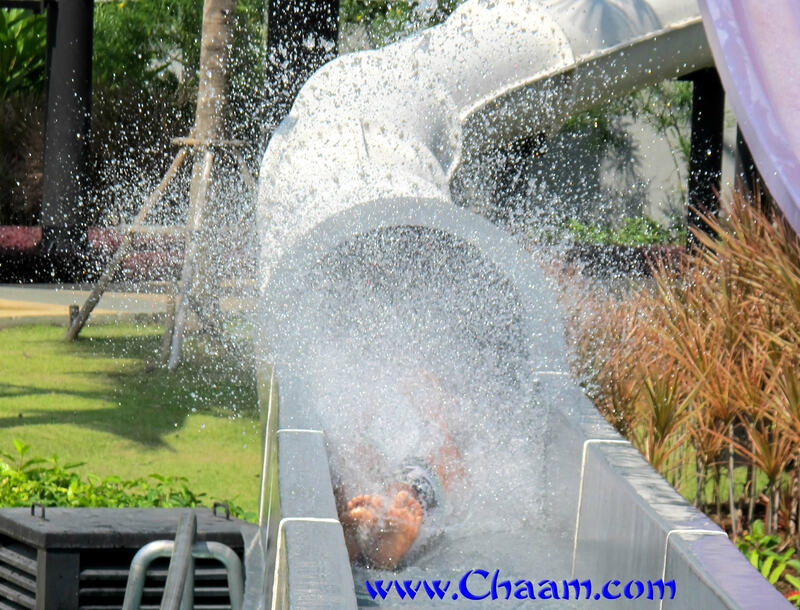 But only in a playful way, because at 30 ° C water temperature and 35 ° C outside temperature sport is not easy. 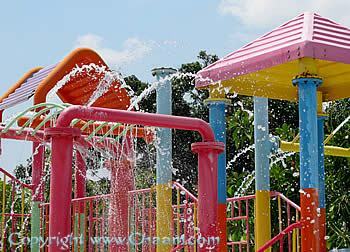 Everywhere were small and picturesque water landscapes created where you can play with your children. 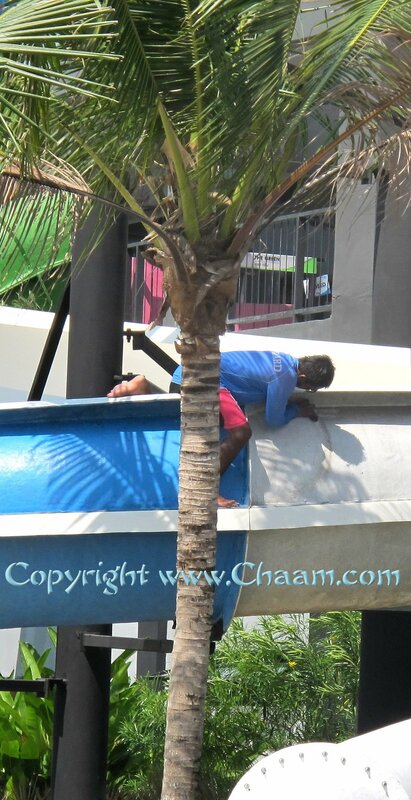 Generally, it is a very safe and clean park, there care always very polite staff who takes care for cleanliness. Whom the water games are too exhausting, can settle on the black stones. 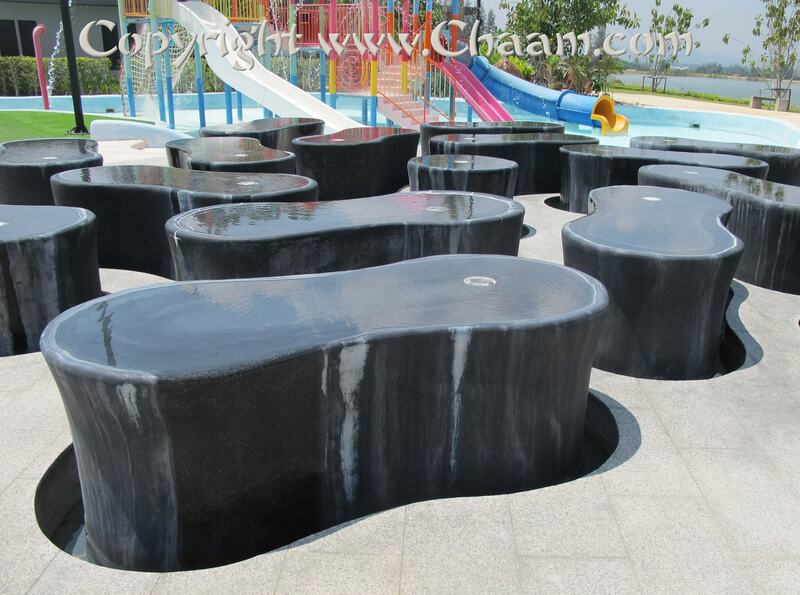 You get a sunbath from the top and absorb the heat from the bottom of the stone. 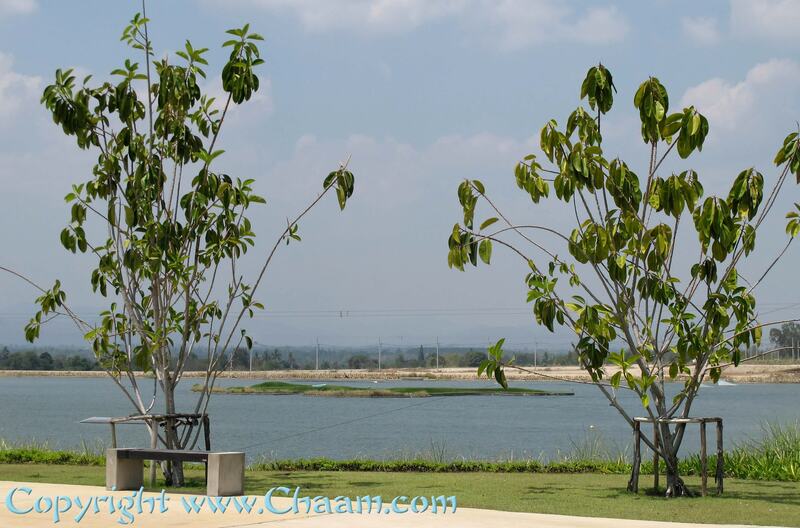 When you lie lazy and relaxed on the stone you will enjoy the beautiful view of the lake. One large pool is a wave pool in which are generated every 20 minutes around 2 meter heigh waves! 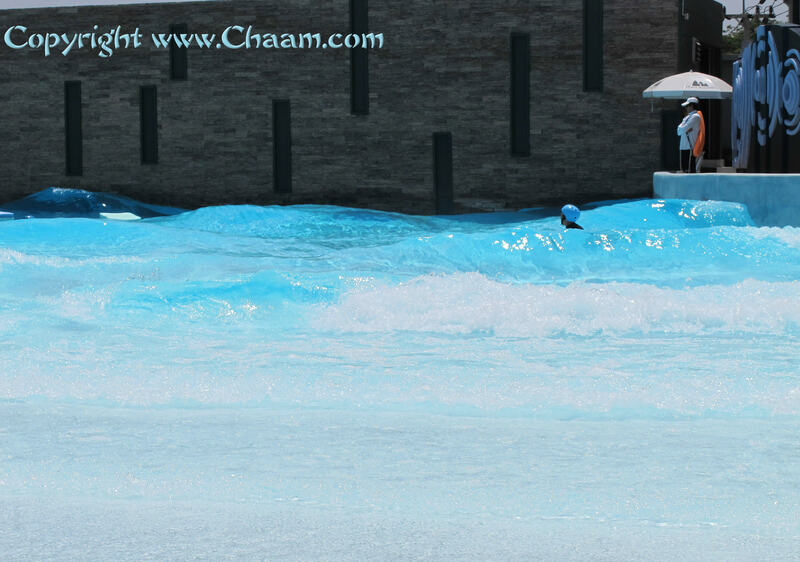 There you can surf on a large swimming board and rocking on the wave crests. 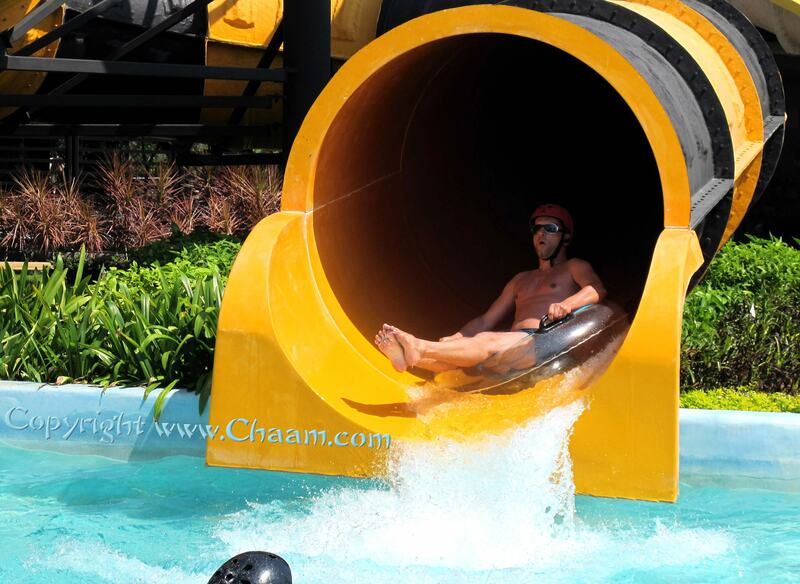 The main attraction of the Aqua Park are the 10 large water slides. 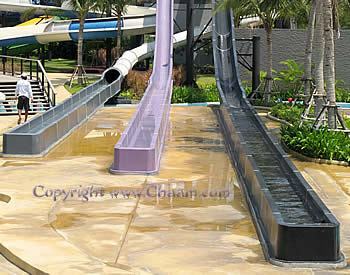 Steep, very steep, curved, covered, dark with neon lights, spiral and large water slides, where you can slide with two children together. 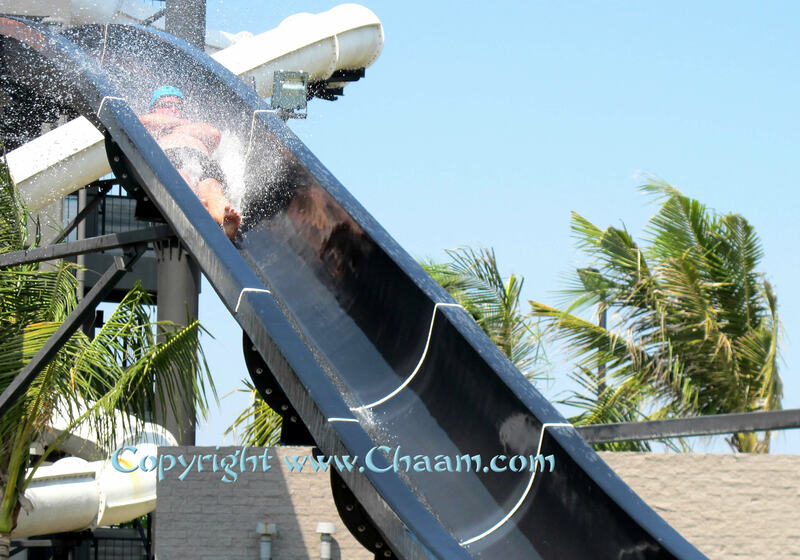 Some slides are so steep and you get such a insane speed that you have to wear a helmet. 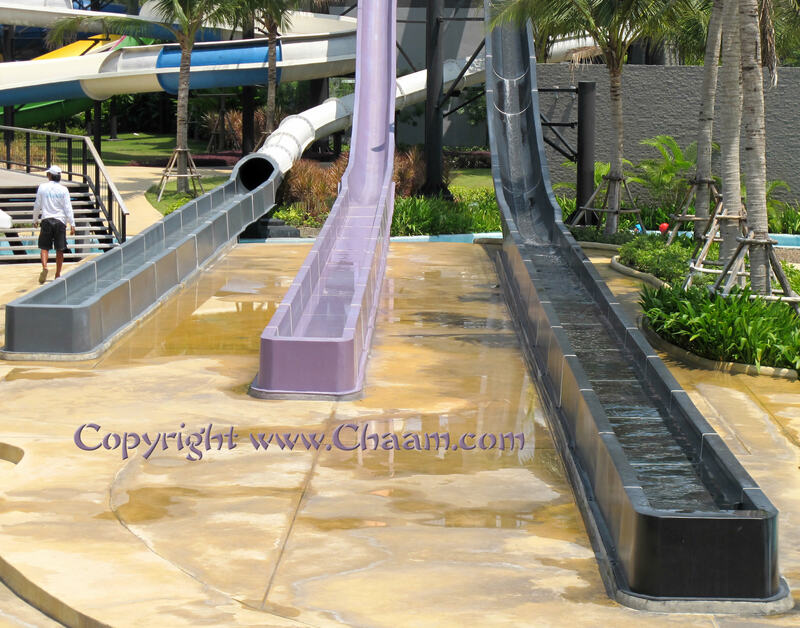 The three high-speed water slides have separate outputs with a long run-out zone. 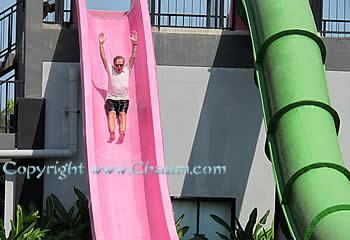 You can say in general, the thicker and heavier the slider, the faster and farther he slides! Two water slides are leading almost vertically downwards, so the acceleration is like a free fall. The speed of the fast water slides is really extreme. But the fun factor, too! The large water slides are of course not only the main attraction for the kids. In the true man there is a child hidden which want to play! 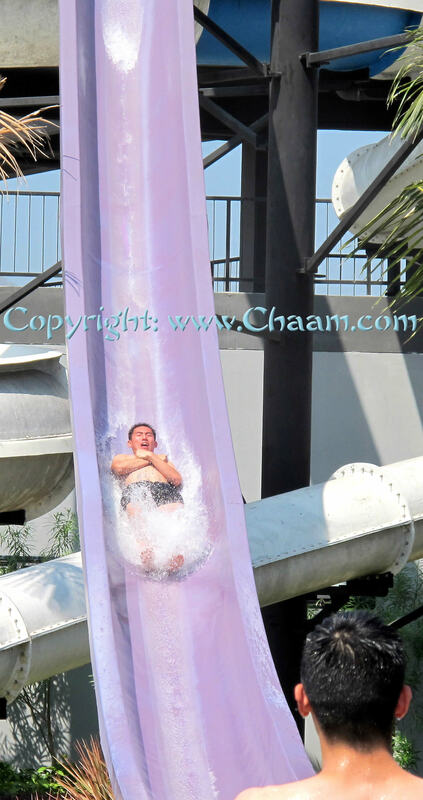 In front of EVERY water slide is a trained security staff member who is responsible for the smooth and especially for an accident-free use of his slide. The total number of staff is admirable. 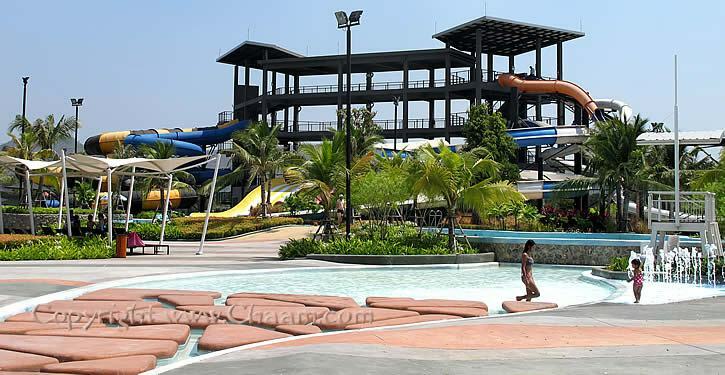 When we visited the Waterpark, ther were only 20 guests in the park, but we counted more than 30 persons of security staff. 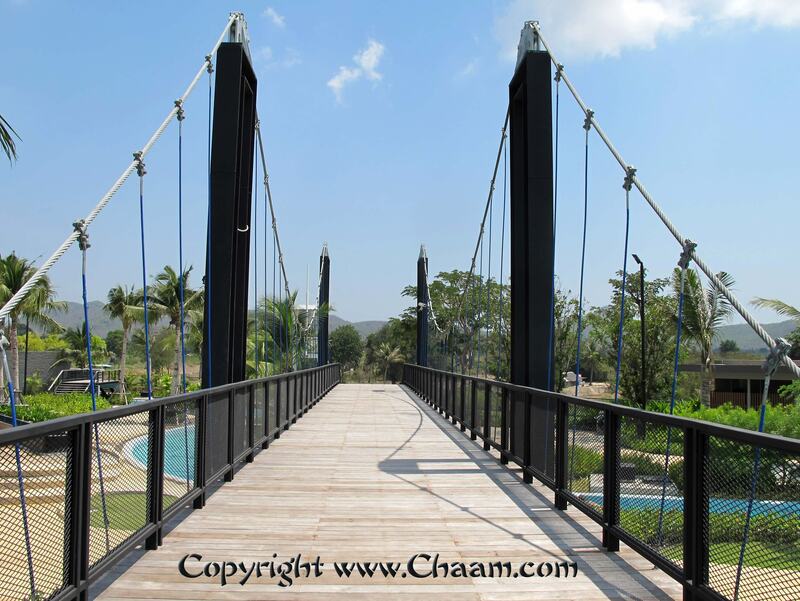 Repairs and improvements are made constantly, so that the safety is kept as such. 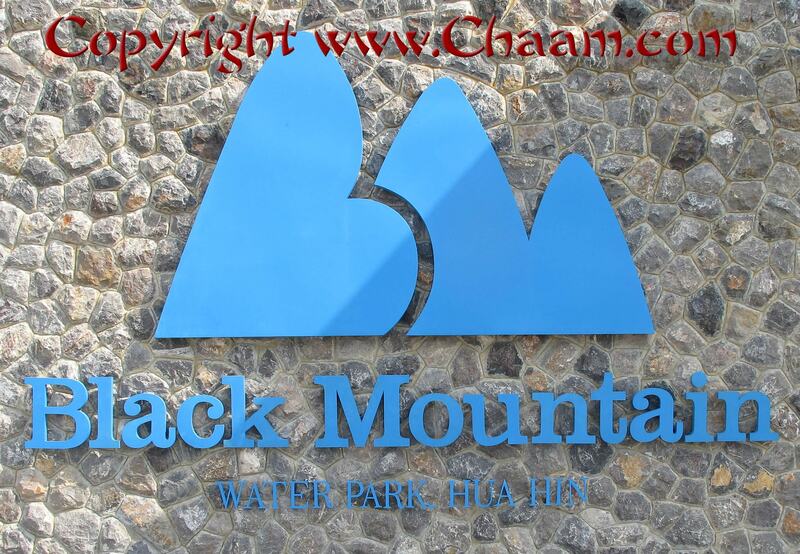 The Black Mountain Water Park is an ideal place for families to spend an entire day. 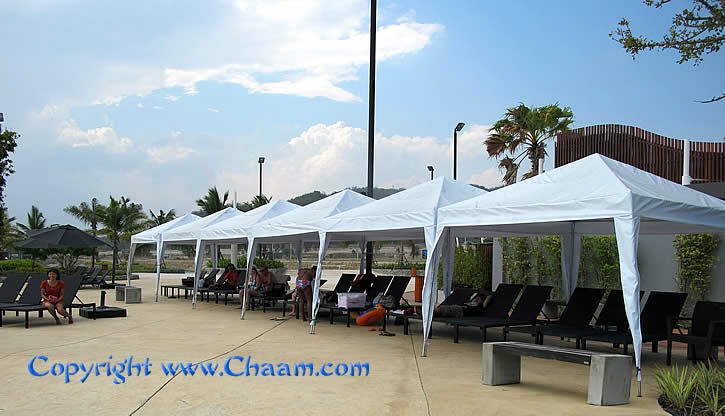 Especially for children and infants, there are many attractions, water games and many umbrella covered chairs, where you can spread with the whole family and use 5 or 6 chairs next to each other without disturbing anyone else. 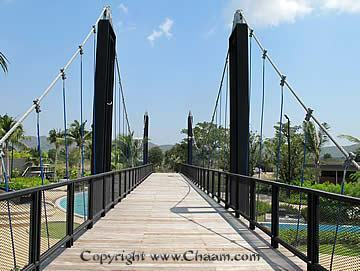 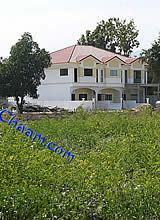 The distance to Cha-Am is not far, by car or taxi it takes about half hour. 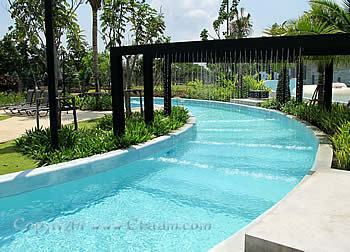 There are restaurants, snack bars and a nice pool bar in the water. 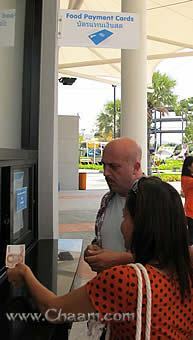 The soft drinks are cheap, so you pay 20 baht for a half liter of water or 30 baht for a can of Coke. The food is, however, more expensive: French fries with mayonnaise cost for example 100 baht. But the quality and the service are very good in the restaurant. In our opinion, is the water park is one of the best and most beautiful excursion destinations for families and for men which have remained a child when it comes to water slides!